Today is a snow day -- no teaching in The Bronx -- so I'm trying to catch up on several projects. One decision I wanted to note, however: after three years of participating in the International Documentary Challenge I won't be part of it this year. The timing just wasn't going to work out, and while we will be making a film with one of the subjects we met in planning for the event, we won't get the excitement of trying to make a documentary in five days. Good luck to everyone who participates. Maybe next year. 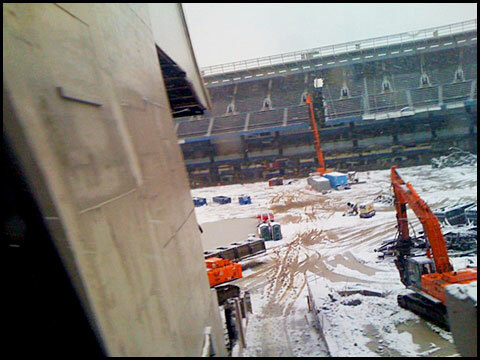 Above: Old Yankee Stadium yesterday, as seen from the 4 train.